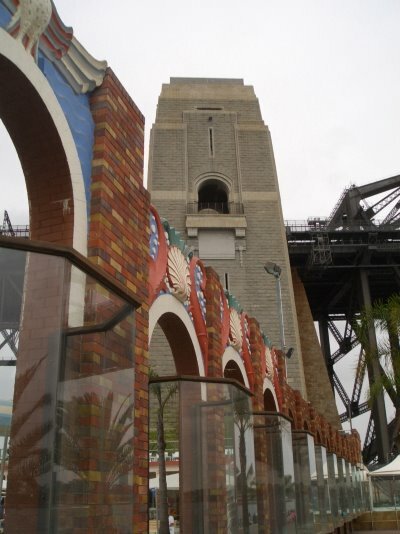 Wed 4 Jan 06: Commenced initial 2 hour exploration of Sydney Harbour on foot, started at Kirribilli (home suburb of the Australian Prime Minister), walked under the Sydney Harbour Bridge on a meandering path which took us past the North Sydney Olympic Pool (in photo above), which looks charmingly art deco, then past Luna Park. The weather conditions were perfect, overcast and only 21c, walked all the way to the Sawmillers Reserve at Blues Point. We completed the loop by returning via the suburbs that fringe the harbour. Loads of gorgeous little historic cottages, narrow streets and cute corner stores. MDR was able to describe to MB the provenance of every major vessel that happened to be in view on the harbour. After our little trek we returned to Neutral Bay at around 7pm, then had the agonising decision of where to dine, there are countless restaurants within walking distance of our apartment. Settled on Japanese at Samurai Sushi, in Military Road. Great choice, it's a new restaurant so the service was awesome and the food was very generous and tasty, although MB was a little bemused with two of the specials of the day, the Robster Sushi Salad or the Soft Sell Crab!